The biggest stars in men’s golf will battle for the 2019 US Masters green jacket from Thursday April 11. Who will win the first major of the year? 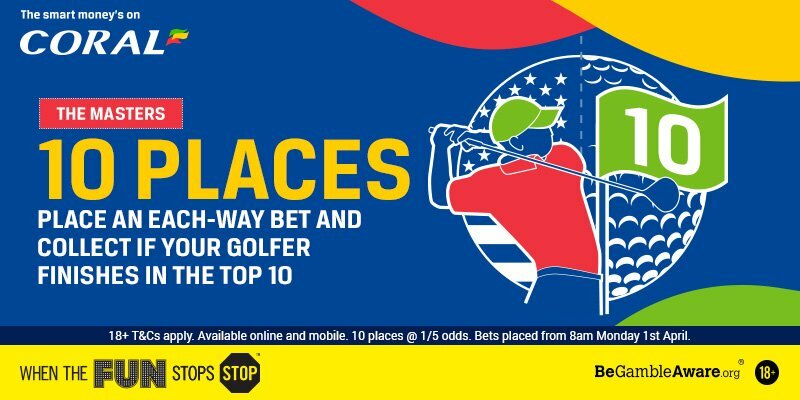 Check out here our 2019 US Masters betting preview, with exclusive promotions, best odds, betting tips and free predictions on Winner, First Round Leader, To Miss The Cut, Top 5 Finish, Top 10 Finish, Top American, Top European golfers and much more! Played at the iconic and stunning Augusta National, the US Masters is the first of four major championships played throughout the year. The field is by invitation only, so we see a reduced field of just 87 players this week, including former champions, amateurs and the top 50 in the world. Defending champion Patrick Reed will be looking to become the first player to win back to back Masters Titles since Tiger Woods achieved the feat back in 2001 and 2002. RORY McILROY is the ante post favourite. The Northern Irishman has finished Top 10 at Augusta each of the past five years (T8-4-T10-T7-T5). He has won the Players Championship in his last stroke play outing, capping off a dominant run of tournaments that saw him finish T4, T5, T4, 2 and T6 in his previous five tournaments dating back to the Sentry Tournament of Champions in January. . Since the turn of the year, he has finished no worse than T6 in six stroke play events. DUSTIN JOHNSON has made the top 10 on his last three attempts in Georgia. His strokeplay record this year reads 1-49-9-1-5-6. He ranks 2nd for scoring average, 5th SG: Tee to green, 10th SG: Approach the green and 13th for SG: Putting and 14th SG: Off the tee. RICKIE FOWLER is still searching for his maiden major title, and came close at last year's Masters – falling one shot short of Patrick Reed. This year he has won the Waste Management Phoenix Open and finished runner-up at the Honda Classic. JUSTIN ROSE, who supplanted Dustin Johnson at No. 1 this week, has been a runner-up twice. He's a winner at Doral and won recently at the Farmers Insurance Open in January. JUSTIN THOMAS comes with a number of fantastic stats - 4th in SG: approach, 4th in SG: tee to green, 10th in SG: around the green, 3rd in SG: total, 1st in birdie percentage, 1st in scoring average. He has a trending upward at the Masters (T39-T22-T17) and we expect him to be a serious contender thius year. JON RAHM has been in excellent touch this year, recording six Top 10s from nine events so far in 2019. He finished 4th at the Masters last year, recording an impressive 65 in the third round. FRANCESCO MOLINARI finished T20 last year at the Masters but that was before his form and game really took off. The Italian had a sensational back half of 2018 which saw him win the Open Championship and recently finished 3rd at the WGC Match Play event. JASON DAY boasts four top 10 finishes from nine PGA Tour events in 2019 including a fantastic T8 at The Players Championship just last month. He has had some back issues that hindered most of his March, however, after taking a week off over the Valero Texas Open, he should be fit and ready to go. HIDEKI MATSUYAMA is a high ball hitter with a good record at Augusta. He ranks second in strokes gained approach this season and recently finished T3 at Torrey Pines, T9 at Riviera T8 at the Players. JORDAN SPIETH has played Augusta better than anyone over the past five years—T2-WIN-T2-T11-3. He has been very disappointing this season, with no top-10 finishes anywhere since last year’s British Open (a streak of 15 events). PAUL CASEY has been impressive in his last four results at the Masters, finishing T6-T4-6-T15. He neters the Masters on the back of a victory in the Valspar Championship among four Top 10’s this year. TIGER WOODS has finished inside the T10 thirteen times in 20 starts, and was T32 on his return here after his fourth back surgery. He finished T5 at the Match Play, which was his second top-10 in three starts (the other came at the WGC Mexico). MATT KUCHAR has good history at the Masters with four Top 10’s since 2012 – T3 (2012), T8 (2013), T5 (2014) and T4 (2017). He arrives off the back of a very impressive 2nd place finish at the WGC Matchplay and T7 in last week’s Valero Texas Open. BRYSON DECHAMBEAU announced himself on a world stage by playing well at Augusta as an amateur in 2016, and also made the cut last year. The Californian has won five times between June 2018 and February 2019, making him one to follow. TONY FINAU had one of the more eventful Masters debuts last year—after an ace in the par 3 contest, he badly turned his ankle while celebrating. He recently achieved top ten finishes in the US Open and Open Championship. GARY WOODLAND is sixth in strokes gained off the tee (hugely important around these parts), eight in strokes gained tee to green and second in birdie percentage. Altough he has been poor at Augusta in his career, he is having probably the best, most consistent season of his career and could be a dark horse. J.B. HOLMES won at Riviera this year and holds the course record of 62 at Doral, which he shot four years ago when finishing second. The Genesis Open winner was also fourth here three years ago. CAMERON SMITH has already posted two T5 in Majors in his short career to date, with the most recent coming here at Augusta on his second appearance last year. T10 at Torrey Pines and Mexico this term are exactly the places you'd like to be playing well on before arriving in Georgia. Don't miss our recommended bets on the Masters 2019. Feel free to copy our US Masters expert picks and get the highest odds available on the market by clicking the 'Bet' button! Plus, we invite you to take a look at our Price Boost section to claim enhanced odds on today's events. Augusta is known for huge elevation changes and uneven lies so we are looking for a top iron player that can play all the shots and especially control his distances in the swirling winds that the course is known for. The 7,475 yard, Par 72 dates back to 1930 and throughout its history, all 18 holes have been etched in folklore in one way or another. Designed by Bobby Jones and Alister MacKenzie, the course has undergone many changes over recent years. The club is always looking for ways to tweak the golf course. In recent years, this has typically involved lengthening it by either constructing new tee boxes or purchasing land from the surrounding area to stretch the club’s boundaries. Nine of the last 10 were ranked inside the World's top 30. Since the Masters began, just 4 players have won after missing the cut the previous year (including Patrick Reed last year). Back 1 golfer to win the Masters and back another 4 for free at PaddyPower! "US Masters 2019 Betting Tips, Predictions & Odds (Golf - April 11-14, 2017)"